As deranged by the Donald are this new era’s leftists, so too are these “conservatives” around a sharp bend. The day after I dared question – on MSNBC – NATO’s relevance three decades after the fall of the “Evil Empire,” I heard it said that federal revenues were up in 2018, so the Trump tax cut financed itself. Folks, “federal revenue” goes go up every year. It sounds “simple.” And it is… in a way… and maybe not the way you might think. 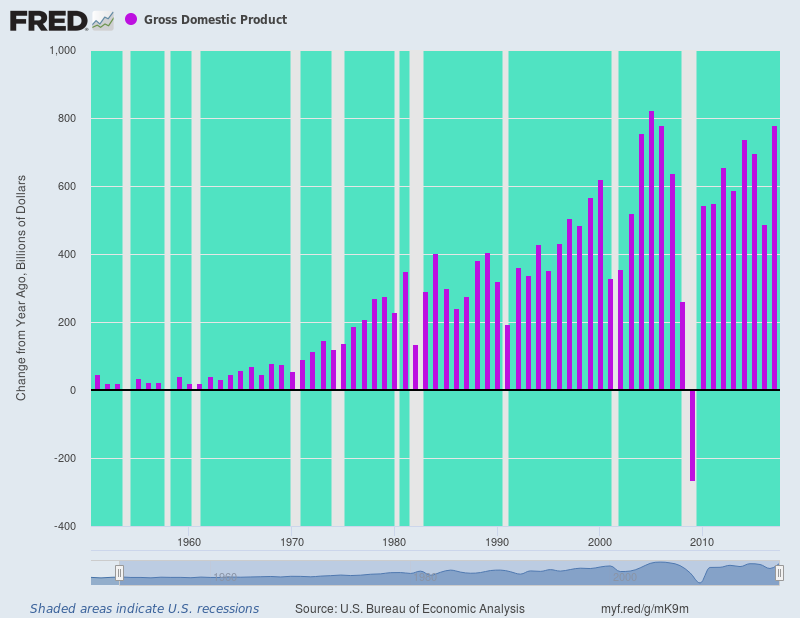 “Nominal” gross domestic product (GDP) goes up every year, too. Well, it has in 67 of the 68 years since 1950. The only exception is 2009. And we know what was going on then. Indeed, you can still see impact of the Global Financial Crisis/Great Recession. And you don’t even have to look that hard. White spaces in the chart represent recessions. That last one was rough, the only one of 10 where federal revenue didn’t rise. Uncle Sam taxes nominal incomes – GDP, in other words. So, even if real GDP is flat to mildly negative, federal revenue can go up year-in, year-out… these days, it’s because monetary central planners get their 2% inflation. The bottom line – if you want the financial truth – is you must compare actual post-Trump tax cut revenue with the estimate of what would have been generated at the prior rate. But when you start to get to that level, it doesn’t look as good as Bubblevision partisans would have you believe. In the first place, preliminary data show that, as a technical matter, federal revenue didn’t go up in calendar 2018. And, at a deeper, “core-to-core” level, we saw an actual slowdown in wage and salary growth. That’s what’s happening on the ground… to Main Street voters, who live the real terrain, not the simple maps these “conservative” clowns draw. Here comes another one, in the form of new book, Trumponomics: Inside the America First Plan to Revive the Economy, authored by the “intellectual” cohort in that car, Art Laffer and Stephen Moore. Here they discuss their advice to the Donald during the campaign and after he disrupted the Clinton Restoration. We assured Donald Trump that a business tax would help most dramatically to restore American economic growth. He asked how big of a tax cut we could afford. We told him to go as big as possible… To get the economy jump-started and to help middle-class workers. “Don’t get stressed out by phony numbers of Washington’s bean counters,” Larry instructed. “They are always wrong. And the benefits of a higher economic growth far outweigh the cost of short-term deficits. So, every dollar the government borrows and spends is money taken out of the economy from the person who buys the bonds… So, at best, the net effect of borrowing on stimulating the economy is zero. This is what happens when “leading” conservative commentators, thinkers, and economists become rank political opportunists. They’re clowns. And they’re selling snake oil. We don’t really need to wait for Nancy Pelosi’s legions and AOC-and-MMT-style socialism to wreak havoc on the American economy. These so-called conservatives are already doing the job. Alexandria Ocasio-Cortez – or “AOC,” as a fawning Mainstream Media has anointed her – is the Member of the U.S. House of Representatives from New York’s 14th district.